Durable leather gloves get one step tougher with baked-in waterproofing sealer. Each pair is heated in the oven—three times—to cure the sealer. 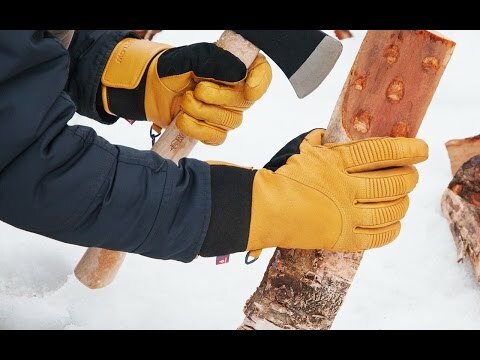 More flexible than ski gloves, these unisex winter utility gloves are dexterous and toasty warm, thanks to HeatRac insulation. For anyone who spends time in the cold, it's a perfect balance of warmth and function. Extra Large: 8 - 8.25"
Well made, durable and warm. Hands never got cold on my ski trip. These are very easy to work in. Soft and subtle. Flylow Gear bakes their waterproof winter gloves—yes, you read that right, bakes—in Colorado. Each leather glove is heated three times to cure the double hand-coated, waterproofing sealer. The result is extra durable gloves that are still flexible, making them popular with skiers. This design is practical beyond the slopes, too. Anyone who spends time in the cold outdoors can benefit from a pair. PrimaLoft filler insulates a rugged leather exterior, which is far stronger than typical synthetic materials. They mimic work gloves but with much more warmth and dexterity. Founders Greg Steen and Dan Abrams launched Flylow in 2005 to make functional outdoor apparel that stood up to tough winter conditions, and have since become a trusted creator of cold-weather gear. And, yes, they are still baking their gloves in the oven.